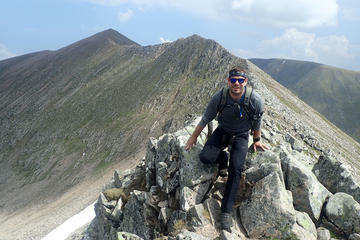 Your chance to join a group to climb the ten highest Munro’s. Over the course of five days we will climb all the 1200m peaks, and top off the whole experience with a night camping out in the heart of the Cairngorms National Park. We’ll start the week in style by climbing to the highest point in the UK, Ben Nevis, by the fantastic CMD Arete, one of the finest routes to the summit. Then days 3 and 4 will be spent in the Cairngorms taking in 5 Munro’s, with a night camping at Corrour bothy just to make the week extra special.